The Tabernacle … stands as a standard of the Restoration of the gospel of Jesus Christ. 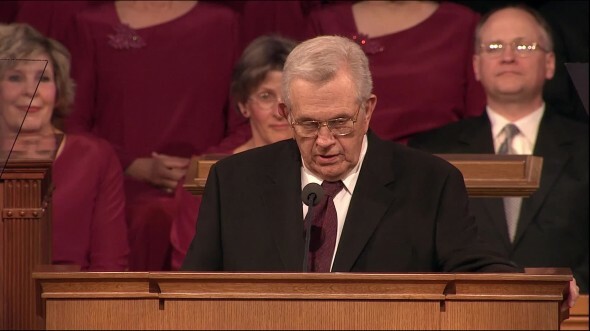 Forty-six years ago I was called as an Assistant to the Quorum of the Twelve, and for the first time, I came to this pulpit. I was 37 years old. I found myself standing among the venerable and wise prophets and apostles, “whose names,” as the song proclaims, “we all revere” (“Oh, Holy Words of Truth and Love,” Hymns, no. 271). I felt how keenly inadequate I was. About that time here in the Tabernacle I had a defining experience. It gave me assurance and courage. Rev’rently, quietly, softly sing our melody. Let thy Holy Spirit dwell in our hearts today. As the children sang quietly, the organist, who understood that excellence does not call attention to itself, did not play a solo while they sang. He skillfully, almost invisibly blended the young voices into a melody of inspiration, of revelation. That was the defining moment. It fixed deeply and permanently in my soul that which I most needed to sustain me in the years to follow. “And after the earthquake a fire; but the Lord was not in the fire: and after the fire [came] a still small voice. “And it was so,” the record says, “when Elijah heard it, that he wrapped his face in his mantle, and went out, and stood in the entering in of the cave” to speak to the Lord (1 Kings 19:11–13). 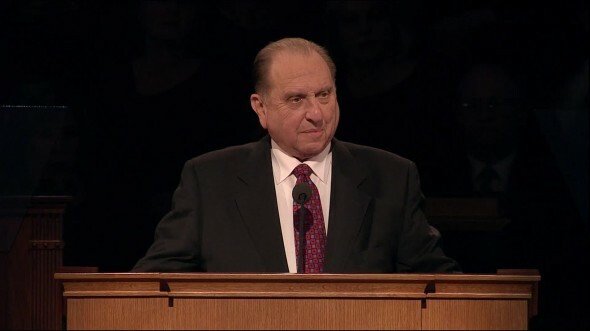 I felt something of what the Nephites must have felt when the Lord appeared to them: “They heard a voice as if it came out of heaven; and they cast their eyes round about, for they understood not the voice which they heard; and it was not a harsh voice, neither was it a loud voice; nevertheless, and notwithstanding it being a small voice it did pierce them that did hear to the center, insomuch that there was no part of their frame that it did not cause to quake; yea, it did pierce them to the very soul, and did cause their hearts to burn” (3 Nephi 11:3). It is this still, small voice which Elijah and the Nephites heard that the Prophet Joseph Smith understood when he wrote, “Thus saith the still small voice, which whispereth through and pierceth all things” (D&C 85:6). In that defining moment, I understood that the still, small voice is felt more than heard. If I hearkened to it, I would be all right in my ministry. 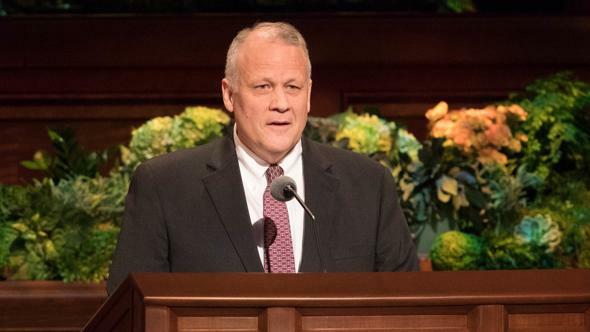 After that I had the assurance that the Comforter, the Holy Ghost, is there for everyone who will respond to the invitation to ask, to seek, and to knock (see Matthew 7:7–8; Luke 11:9–10; 3 Nephi 14:7–8; D&C 88:63). I knew I would be all right. As the years have unfolded, so it has been. I learned too what power there can be in music. When music is reverently presented, it can be akin to revelation. At times, I think, it cannot be separated from the voice of the Lord, the quiet, still voice of the Spirit. Worthy music of all kinds has its place. And there are endless numbers of places where it can be heard. But the Tabernacle on Temple Square is different from them all. For his blessings to the blest. More than 100 years ago, President Wilford Woodruff, then 91 years of age, delivered what may have been his last sermon from this pulpit. In the audience was 12-year-old LeGrand Richards. 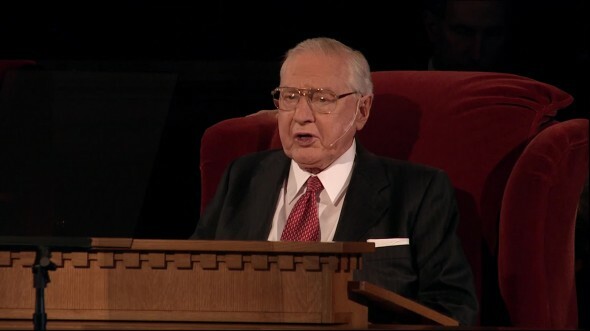 His father, George F. Richards (later ordained an Apostle), brought his boys to the Tabernacle to hear the Brethren. LeGrand never forgot that experience. 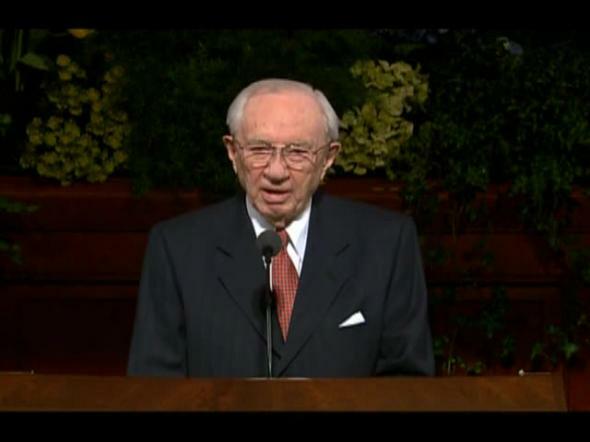 For more than 20 years, I was very close to Elder LeGrand Richards. 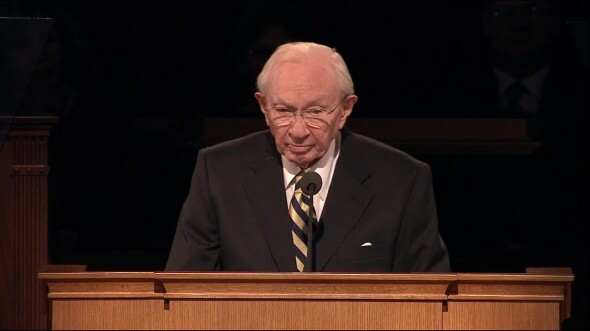 When he was 96 years old, that message still lingered in his heart. He could not remember the words President Woodruff said, but he could never forget how he felt when they were said. On occasions, I have felt the presence of those who built and kept this Tabernacle. By music and the spoken word, those who came before maintained the simplicity of the gospel and the testimony of Jesus Christ. That testimony was the guiding light in their lives. Great events which shaped the destiny of the Church have occurred in this Tabernacle at Temple Square. Every President of the Church, except Joseph Smith and Brigham Young, has been sustained in a solemn assembly in this Tabernacle. 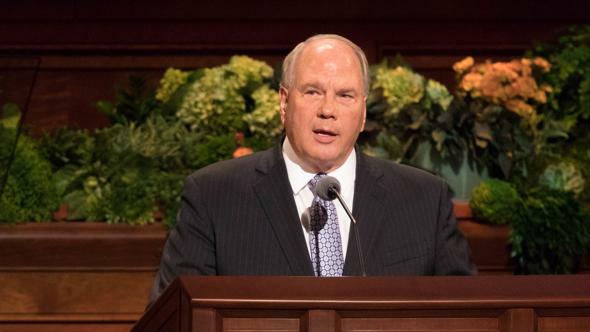 And in similar manner, the sustaining procedure is repeated annually in general conference and duplicated in every stake and ward and branch as required by revelation. 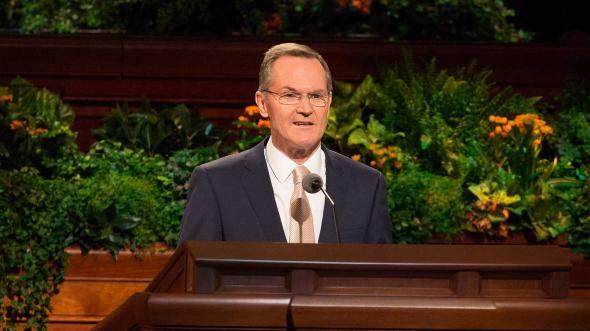 The Lord said, “It shall not be given to any one to go forth to preach my gospel, or to build up my church, except he be ordained by some one who has authority, and it is known to the church that he has authority and has been regularly ordained by the heads of the church” (D&C 42:11). In this way, no stranger can come among us and claim to have authority and attempt to lead the Church astray. Here in 1880 the Pearl of Great Price was accepted as one of the standard works of the Church. Here also two revelations were added to the standard works, now known as Doctrine and Covenants sections 137 and 138. 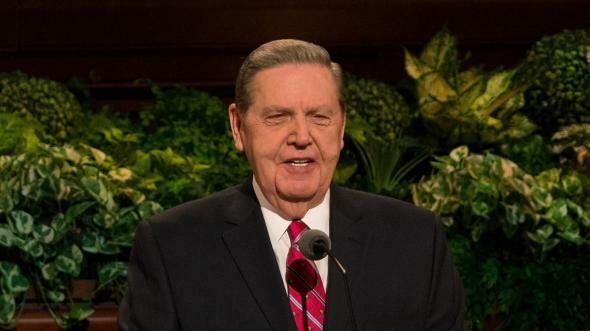 Section 137 records a vision given to the Prophet Joseph Smith in the Kirtland Temple, and section 138 is a vision given to President Joseph F. Smith concerning the Savior’s visit to the spirits of the dead. Here in 1979, after years of preparation, the LDS version of the King James Bible was introduced to the Church. The new editions of the Book of Mormon, the Doctrine and Covenants, and the Pearl of Great Price were announced to the Church here. In 1908 in a general conference, President Joseph F. Smith read section 89 of the Doctrine and Covenants—the Word of Wisdom. Then he, both of his counselors, and the President of the Twelve all spoke to the same subject, the Word of Wisdom. Then a vote to accept it as binding upon the members of the Church was unanimously passed. 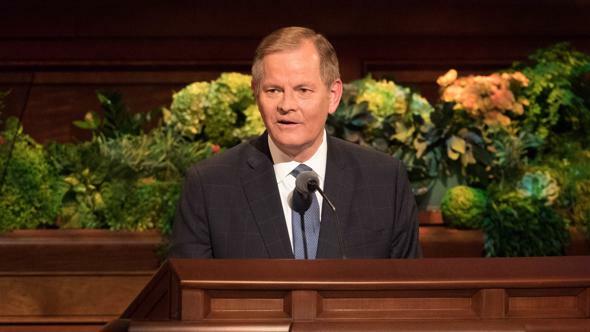 That revelation begins, “In consequence of evils and designs which do and will exist in the hearts of conspiring men in the last days, I have warned you, and forewarn you, by giving unto you this word of wisdom by revelation” (D&C 89:4). It is a shield and a protection unto our people, particularly to our youth. It becomes a part of that “whole armor” of God promised in the revelations to protect them from the “fiery darts” of the adversary (see D&C 27:15–18). The Church and individual members of it have always been, are now, and ever will be under siege from the adversary. He will cover, even erase the still, small voice through loud and dissonant music awash with lyrics that cannot be understood—or worse, by lyrics that can be understood. He will carefully lead us astray with every other temptation he could devise. Here by revelation the Lord clarified the order of the priesthood, and this opened the doors to fulfill the commandment of the Savior to take the gospel to “every nation, and kindred, and tongue, and people” (D&C 133:37) and to cause the Church to be established among them. Here the Book of Mormon was given the subtitle “Another Testament of Jesus Christ.” Thereafter, whoever opens the book will know from the very title what is offered within. 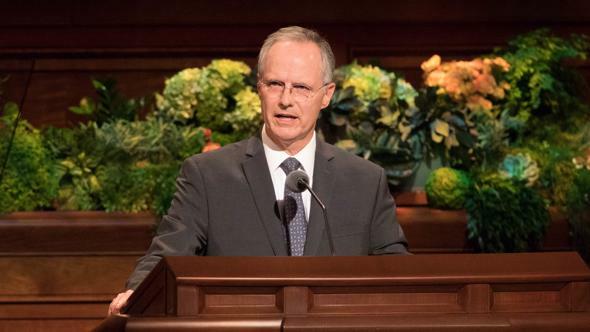 The teachings, the sermons, the music, and the feelings and Spirit in this sacred building transfer without being diminished to the great Conference Center nearby, where they are heard by tens of thousands, translated into dozens of languages, and sent to congregations across the world. 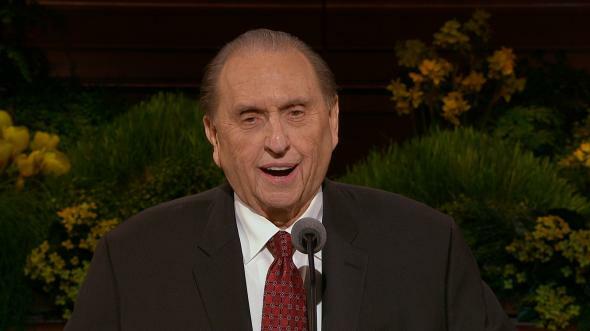 Even more, that Spirit enters into the homes of millions upon millions of Latter-day Saints. In the homes, parents pray for the well-being of their children. Men and women and, as the Book of Mormon promised, even little children can receive the testimony of Jesus Christ (see Mosiah 24:22; Alma 32:23; 3 Nephi 17:25) and of the Restoration of His gospel. This Tabernacle on Temple Square is “a house of prayer, a house of fasting, a house of faith, a house of glory and of God, even [His] house” (D&C 109:16). Those called to speak or to perform words, music, and culture are obligated to present that which is worthy. To seek after the praise of men, the scriptures caution us, is to be led carefully away from the only safe path to follow in life (see John 12:43; 1 Nephi 13:9; 2 Nephi 26:29; Helaman 7:21; Mormon 8:38; D&C 58:39). And the scriptures warn us plainly what follows when we “aspire to the honors of men” (D&C 121:35). It is not so much what is heard in the sermons but what is felt. The Holy Ghost can confirm to all who come within that influence that the messages are true, that this is The Church of Jesus Christ of Latter-day Saints. The Tabernacle stands here next to the temple as an anchor and has become symbolic of the Restoration. It was built by very poor and very, very ordinary people. It is now known worldwide. The Tabernacle Choir, identified by the name of this building, has been a voice of the Church for many years. May they never drift from or allow themselves to be pulled away from the central mission which has been their place for generations. For generation after generation the Choir has opened and closed each broadcast with a message of inspiration, rich in principle and anchored in the doctrines of the Restoration, beginning with “Gently Raise the Sacred Strain” (Hymns, no. 146) and closing with “As the Dew from Heaven Distilling” (Hymns, no. 149). The Tabernacle stands in the world as one of the great centers of worthy music and culture. But most of all, it stands as a standard of the Restoration of the gospel of Jesus Christ. That simple testimony was embedded deeply and permanently in me here in this building by those Primary children singing in reverent, revelatory tones. God bless this sacred building and all that transpires within its walls. How grateful we are that it has been renewed and refurbished without losing its sacred character. 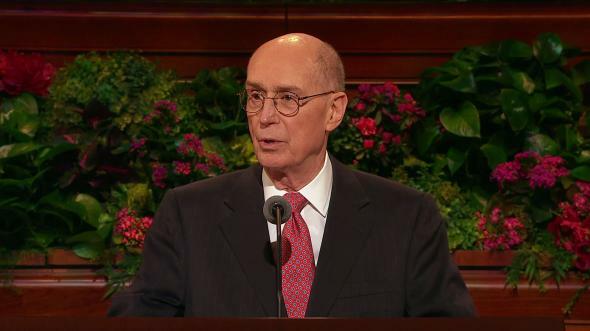 Elder Parley P. Pratt of the Quorum of the Twelve Apostles read these words from section 121 in the Doctrine and Covenants: “Let virtue garnish thy thoughts unceasingly; then shall thy confidence wax strong in the presence of God; and the doctrine of the priesthood shall distil upon thy soul as the dews from heaven. To fulfill thy work of love. Let the dews of life distill. Let our cry come up before thee. And confess the joyful sound. I add my testimony that Jesus is the Christ, that this is His house, on this sacred day of dedication in the name of Jesus Christ, amen.